'Baby Shark' Has Crashed Into the Pop Charts. How Did It Get There? 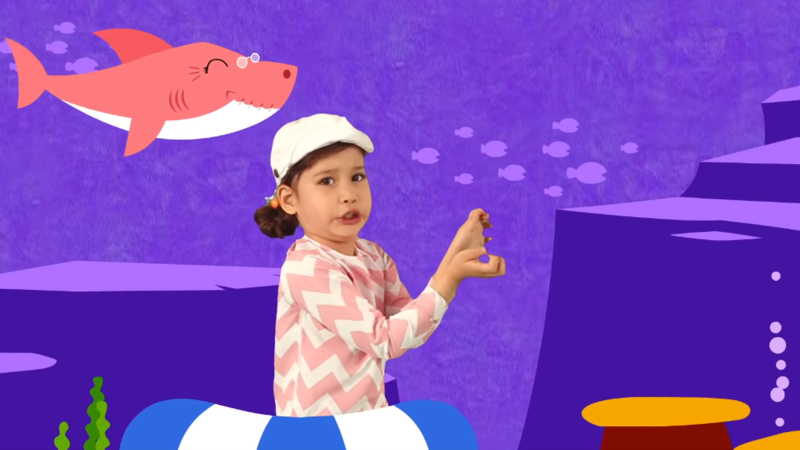 The uber-viral children's song "Baby Shark" landed in the top 40 of the Billboard charts this week, years after it debuted on YouTube. "Baby Shark," a song that has inspired a worldwide dance craze, entered the Billboard Hot 100 at No. 32 this week. Doo doo doo doo doo doo! A delightful song (or grating, never-ending slog, if you're a parent of a young child) about a family of sharks scouring the seas for their next meal has made its way to the Billboard Hot 100. The uber-viral "Baby Shark" charted at No. 32 for the week ending Jan. 12. It boasted 20.8 million streams last week, according to Nielsen Music, alongside its already gargantuan 2 billion-plus YouTube views. If you haven't heard the infectious kids' bop, here's a quick refresher. Now that the song will burrow (or re-burrow) its way into the recesses of your brain at the most inopportune times, inquiring minds may want to know how this simple ditty inspired car-jumpers, children and Ellen DeGeneres to raise their arms in marine-fish formation in the name of the #BabySharkChallenge. The song and dance already existed decades before the South Korean children's company Pinkfong — a heavy hitter in fun-ducational entertainment — spun the success of its "Baby Shark" video into a whole series of animated videos featuring penguins, apes and lions. But according to SmartStudy, Pinkfong's parent company, the meme's first wave of success came from South Korean pop groups. K-pop heavy hitters like Girls' Generation and BLACKPINK — the first K-pop group to perform at Coachella — started taking on the challenge at their live appearances as early as last year. By then, the video had already gained traction in Indonesia, the Philippines and much of southeast Asia. Once "Baby Shark" had caught on with the K-pop set, the rest of the Internet soon got a taste of the phenomenon. YouTube featured it on Rewind, the site's annual year-end roundup of viral video content. It's a frequent favorite on the lip-syncing video app TikTok, which breeds its own ecosystem of viral content. People bolted out of their cars in the name of the #BabySharkChallenge, creating a minor public health scare. Philippine Marines, police officers and firefighters got in on the fun. Even crooner Josh Groban and Game of Thrones actress Sophie Turner took part in a cocktail-hour version of "Baby Shark" with James Corden. Only time will tell if "Baby Shark" will climb up the charts in the vein of other high-charting dance crazes. Silento's 2015 viral hit "Watch Me" — the song behind the "whip and nae nae" — peaked at No. 3 on the Billboard charts, while Drake's "In My Feelings" (which inspired the #InMyFeelingsChallenge) topped the charts for a cool 10 weeks last year. Maybe it won't be long before "Baby Shark" enters the graveyard of Internet memes. Still, even if it doesn't, "Baby Shark" has plenty of life — kids latch on to favorite songs for a whole lot longer than the disposable Internet does.